BBK Performance Parts Gripp Caster Camber Plates are designed to correct front end alignment and suspension geometry when the vehicle has been lowered. 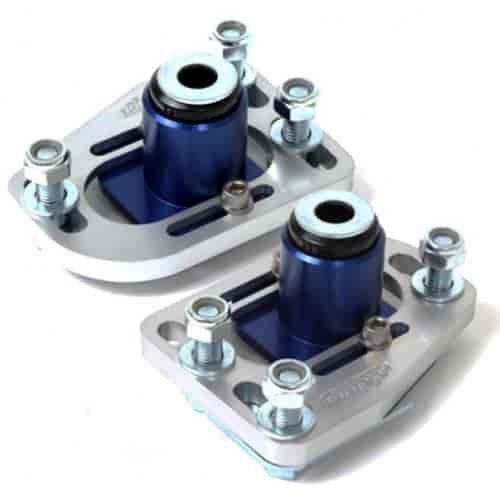 BBK caster camber plates allow adjustment of the caster and camber of the front struts to improve steering input and response and prevent premature tire wear. They are CNC-machined billet aluminum and have a polished finish and include BBK Gripp polyurethane bushings. These caster camber plates will help restore and improve handling for both street or strip vhicles. Note: BBK Caster Camber kits are designed for the original MacPherson style struts. They are not designed to be used with coil over kits. Does BBK Performance Parts 2525 fit your vehicle?